You know stuff is bad when the lawyers get involved. I can roll with what the family is saying, but I just don't understand why Bobby wasn't allowed to reach out to his daughter. Now I understand he might not be 'Father of the Year', but damn not being allowed to reach out to his seed is a little harsh. That's all I'm saying. I don't agree with the way he conducted himself, but at the end of the day Bobbi Kristina is still his daughter. The attorney for Whitney Houston’s family suggested Tuesday that a clash between ex-husband Bobby Brown and security at the weekend funeral for the Grammy Award-winning pop singer could have been avoided if Brown had adhered to two agreements made to accommodate him and his family. One agreement, Atlanta attorney Mark Trigg told V-103’s Frank & Wanda Morning Show, was that Brown, who had been married to Houston for 15 years before their 2007 divorce, would sit with the family at New Hope Baptist Church in Newark, N.J., without others in his entourage. 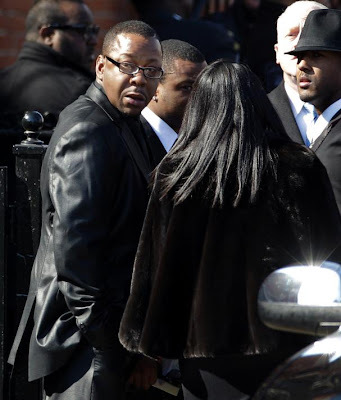 The other was that Brown would not reach out to his daughter Bobbi Kristina during the four-hour service unless she reached out to him first. Brown, however, broke both of those conditions and ended up clashing with security staff tasked with seeing that he followed the agreements, Trigg told Frank Ski and co-host Wanda Smith. “We had a number of discussions prior to the service, and a very clear understanding as to exactly what was suppose to take place at the service,” Trigg told V103. The face-off, which followed days of speculation over whether Brown was even invited to or would attend the funeral, was covered by the media as much as the memorial itself and at times overshadowed the star-studded service carried live on CNN and other media outlets. Trigg, however, told the Frank & Wanda Show that Brown and his children were not supposed to sit together. “This was not about anything other than practical space considerations,” he told the show hosts. Trigg said that when Brown tried to seat himself and his children in the front rows, security “discreetly, politely, respectfully” asked Brown’s children to sit with their uncle. Trigg said that “for whatever reason” Brown took offense. Trigg said the New Edition singer then broke another condition: He reached out to his daughter to get her to intervene. After the clash with security over approaching his daughter, Brown gave the kiss to Houston’s casket and left with his entourage. The attorney also sought to dispel rumors in the days leading up to the service that Brown wasn’t invited.